Work has taken me away from home the past few days but I did manage to get a trip to the Sentry Box in during an hour-long break in my schedule. 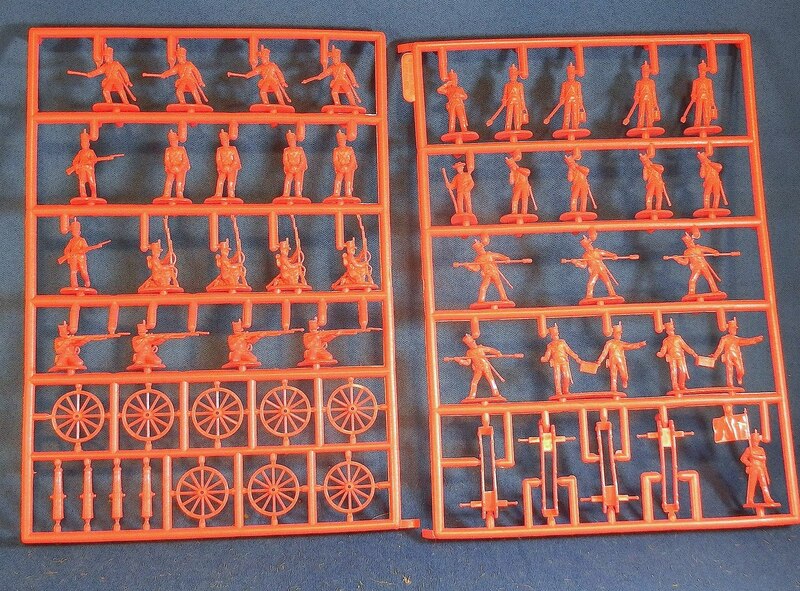 I have been looking for the final troops I need to complete my War of 1812 armies. 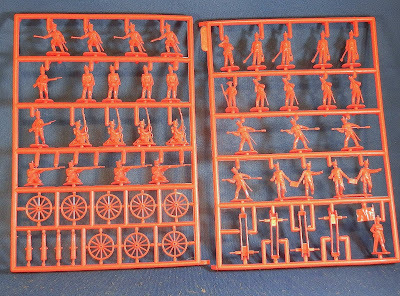 Cannon, wagons and militia were high on my list and the Sentry Box has been stocking more 1/72 plastics lately. Alas, nothing on my list was there! I did, however, find a few workable items. 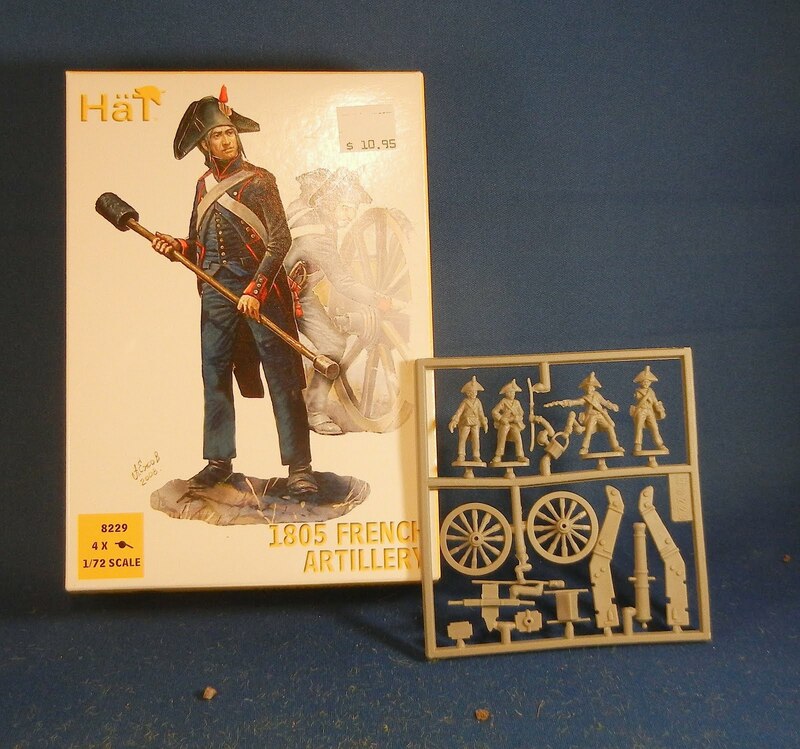 For heavy cannon I bought there HaT French artillery. There four cannon in the box and they will do. The plastic is a bit soft and oily so they will get a wash. I expect I will need to break out the Locktite plastix glue for these but fortunately it is summer so I can do the gluing out of doors. 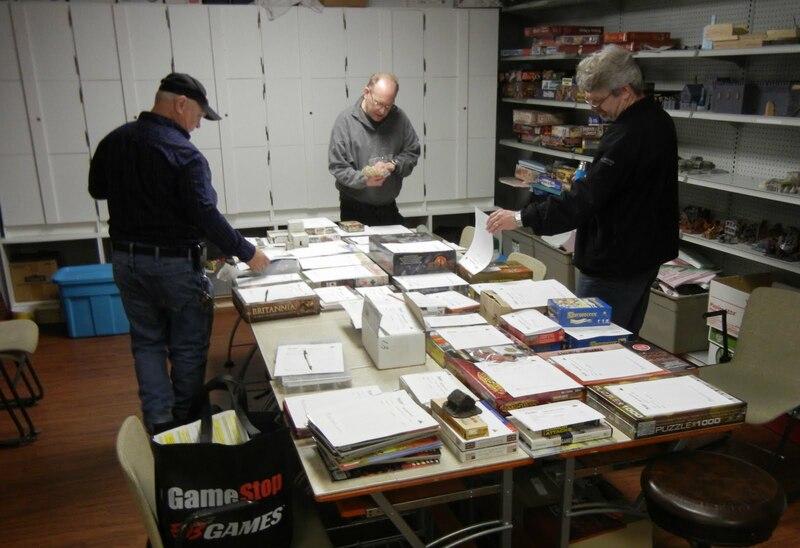 I was resigning myself to buying some Imex boxes to get wagons and militia and civilians. I find their boxes always come with too many figures in too few poses for my needs. But, lo, there were these mixed bags of troops which were perfect. 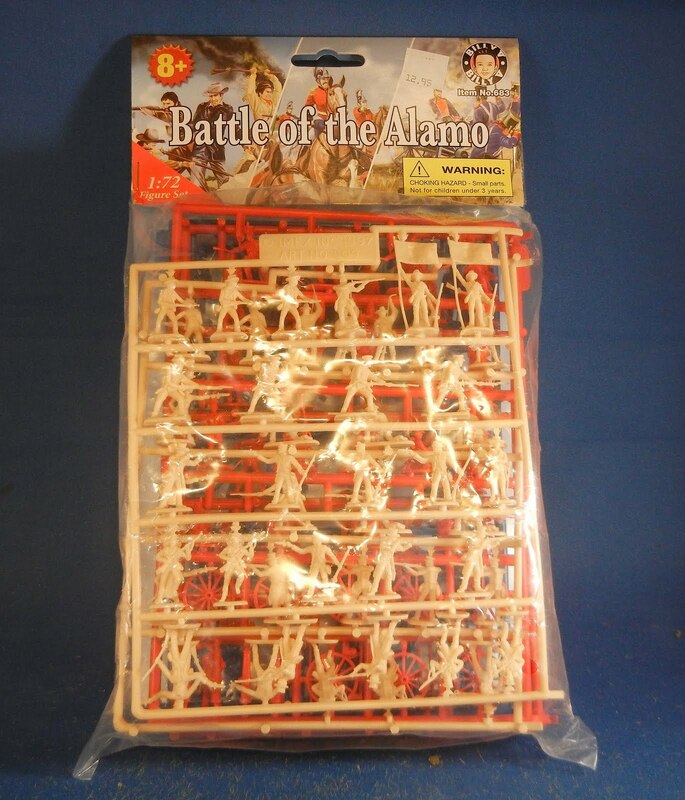 The first one I picked up were Alamo troops. There were three half-boxes in this bag and it included some light cannon which can be mixed with the heavier HaT cannon so each side has some variety. There were also some troops in stove pipe hats which could be used for either side. 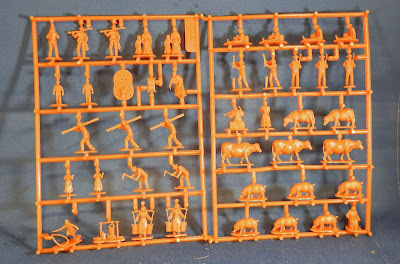 A second set of sprues (not pictured) contained even more troops. There were also some Alamo defenders who have the odd-ball hats that are useful for militia. Combined with some rougher-garbed figures from the Imex AWI American box that I won at the club auction means I now have some very good militia fodder. 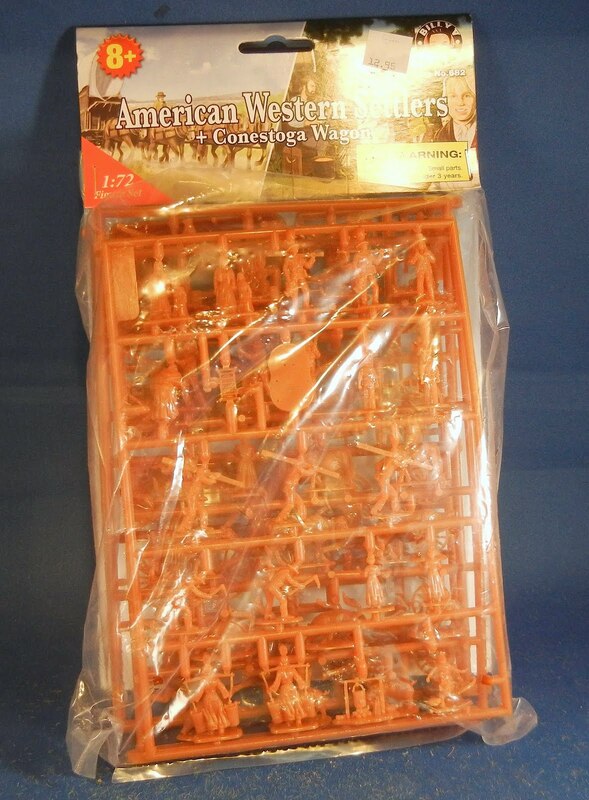 I was also looking for some wagons and settlers. And behold there was a pioneer bag as well. 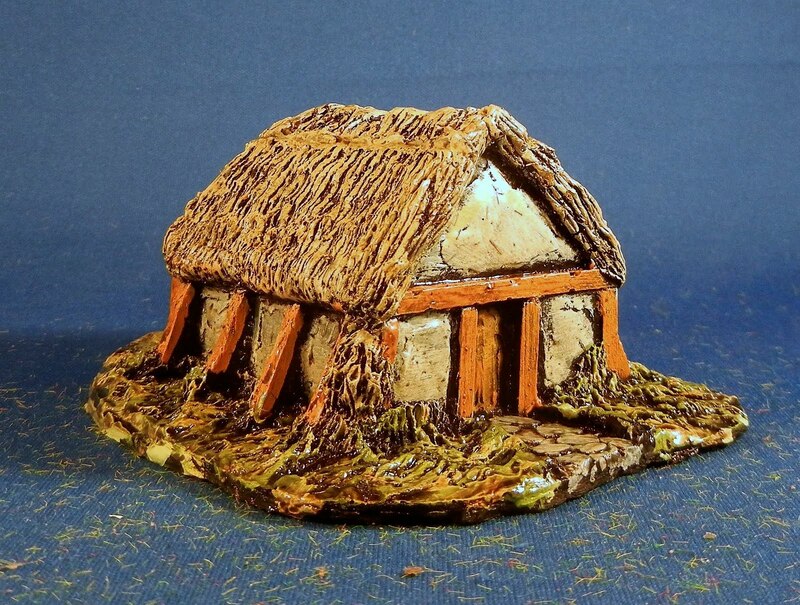 This contained one sprue of settlers and cattle. This should be useful for populating some camps for these armies. I will just need to find some tents. 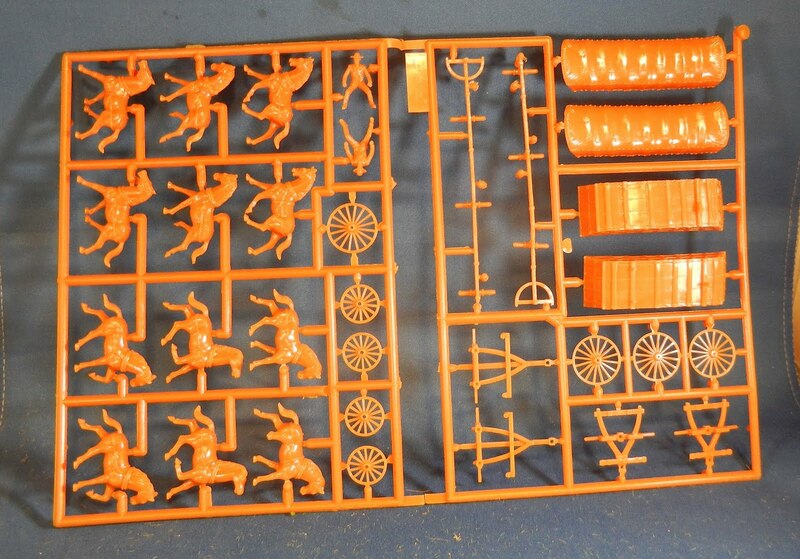 It also contained two wagons, which will be handy for scenario objectives. 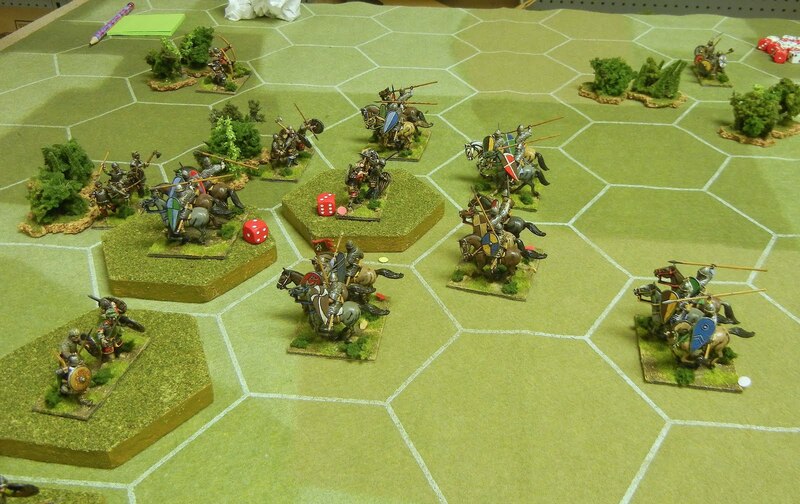 Bruce has a wonderful "ambush the wagons with Indians" scenario. 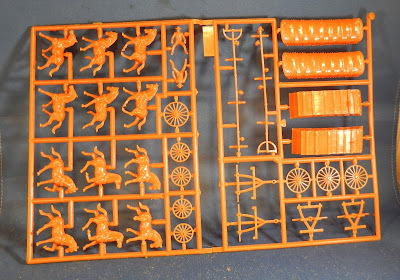 I was hopeful to find some wagons suitable for conversion to a 28mm Norman War Wagon but no luck. On the way back home, I stopped in at Compusoft in Red Deer. It has been about five years since I was in and I'm sorry I waited so long. This store is amazing, with better than half the floor space devoted to games, models, trains, paints and miniatures. This is a must-see for gamers! Up next: With some free time, I plan to base and prime some 15mm Hebrews this weekend as well as finish building some 28mm Norman foot. 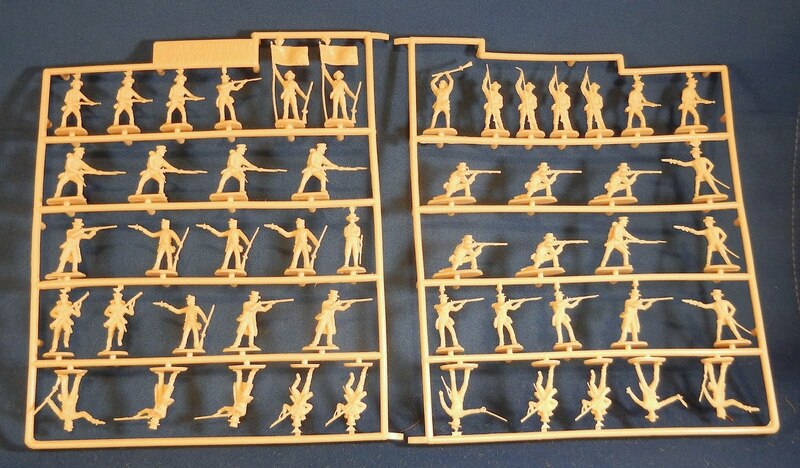 These War of 1812 figures will need to wait awhile until I clear a commission and get the Normans finished. We have club this week so I'll need to think about a game for that as well. I have a couple of commissions haunting the shelves around my painting station. This is a 15mm Philistine army by Essex. 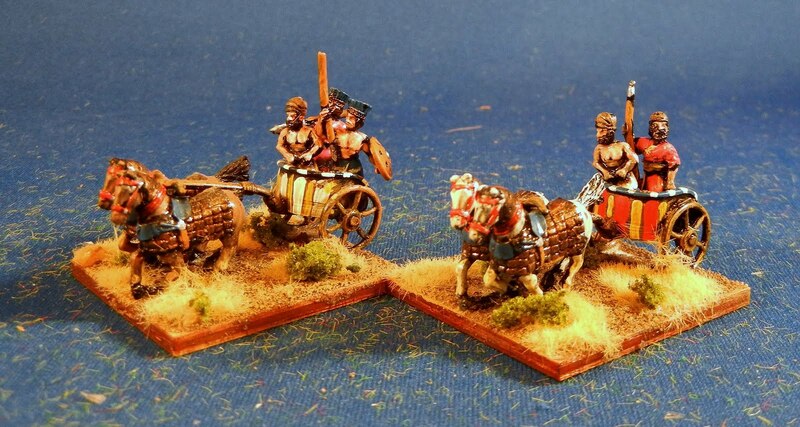 The army has two chariots (perhaps one being a heavy chariot, given there were three riders). 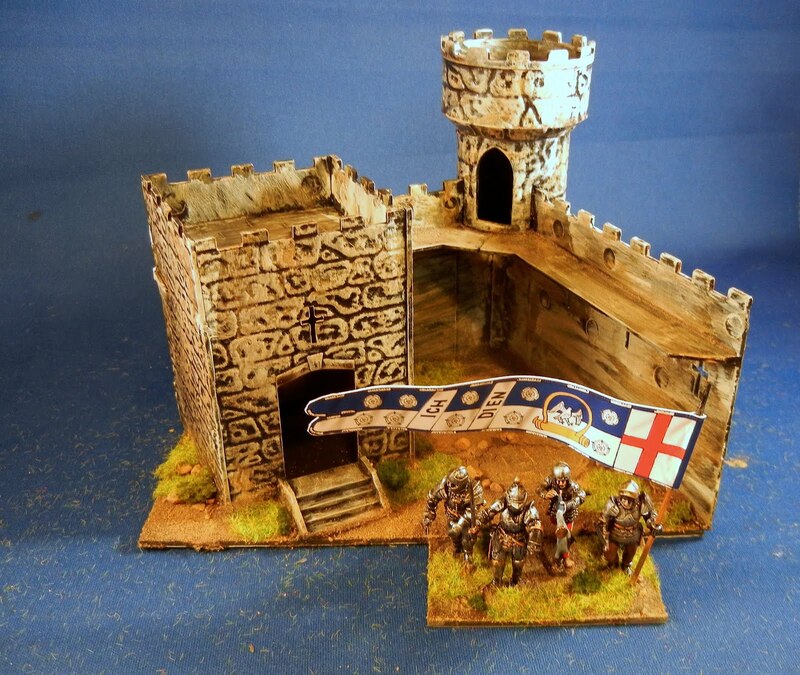 These went together very nicely.I decided to go with an arid look to the basing. There are also six bases of 3Bd. Essex has very tiny bases on their figures. This is visually nice but sometimes poses practical challenges. 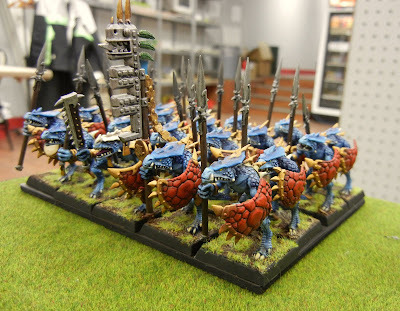 I ended up using crazy glue accelerated with PVA to get these guys to stay on the paint sticks and the base. The monopose (which I like) makes the figures look quite uniform. I tried to mix it up by changing the cloth from figure to figure although keeping with the blue theme I'd agreed to with the owner. There are also two bases of 3Ax. These guys were the trickiest to base as the integral base is about the width of an HB pencil lead. And there were two bases of 2Ps skirmishers below. Up next: I have both 15mm Early Hebrews and 28mm Norman foot cleaned and read to prime. LIkely I'll get to the Hebrews first to advance this commission to conclusion. I have a buttload of Norman shields to glue on before I can primer. 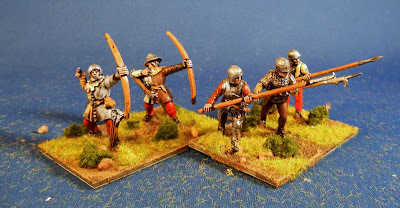 After some dithering in garden, I managed to complete the core elements of my HYW English army. This supplements the archers I finished in early May. First up are four bases of blades which were made from the remainder of the Perry plastic bill-and-bow box. 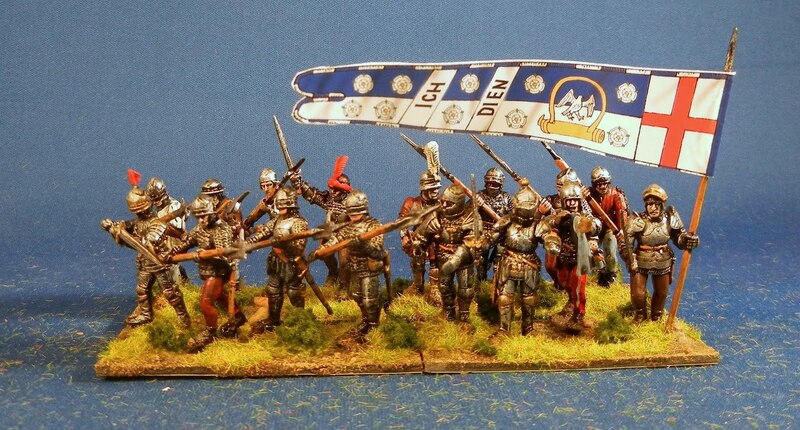 The banner is also nicked from there although it is a WotR banner. Good enough for the girls I game with and certainly better than anything I could do by hand. There are also three bases of knights. On the left we have some old metal fellows I got in a trade. I upgraded their shields but otherwise did not meddle. The centre and rights bases are GW metal riders on plastic Bretonnian horses. 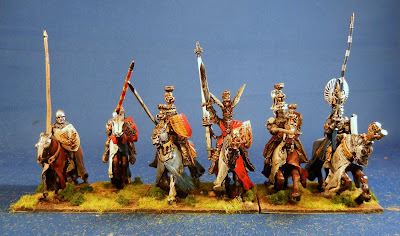 These fellows need some decals on their shields and would look better with some colours streamers on their lances. 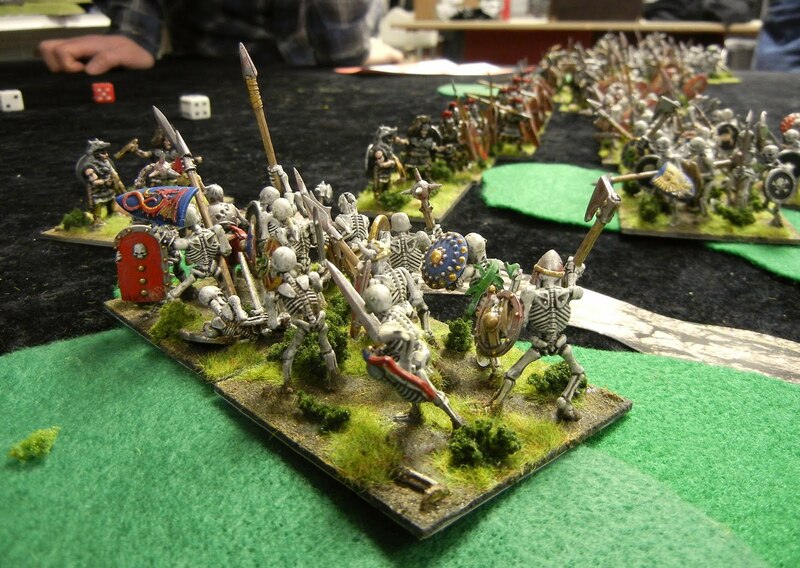 The light troops include a base of psiloi (GW Bretonnian bowmen) and a base of spear (Perry plastics). I also put together this huge mortar from the miscellaneous box. They need a crew man with a torch--I will add that when I find an extra figure laying about. Below is the camp, constructed from pieces of an old Airfix Robin Hood castle. Up next: A 15mm Philistine DBA army is rolling of the benches (maybe tomorrow, maybe not). Then onto some 15mm early Hebrews an some 28mm Normans. We had nine guys out at the club last night with two games running. 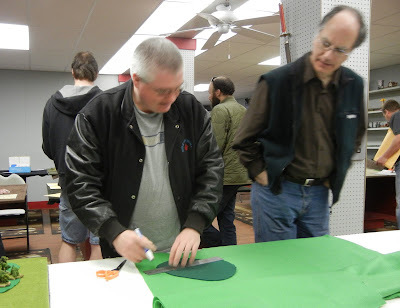 I hosted Terry, Jonathan, Matthew and Scott in a game of Battlelore. 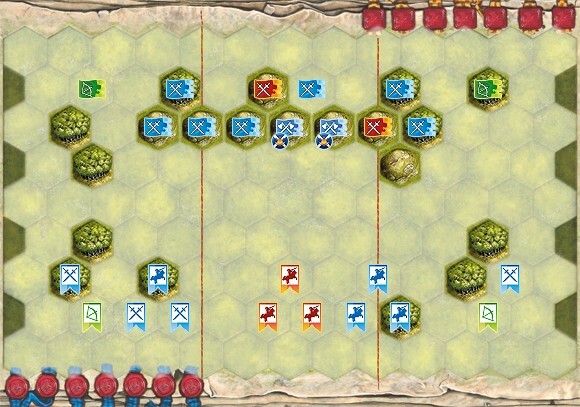 I used a Hastings 1066 scenario, with each side having six cards and six banners. 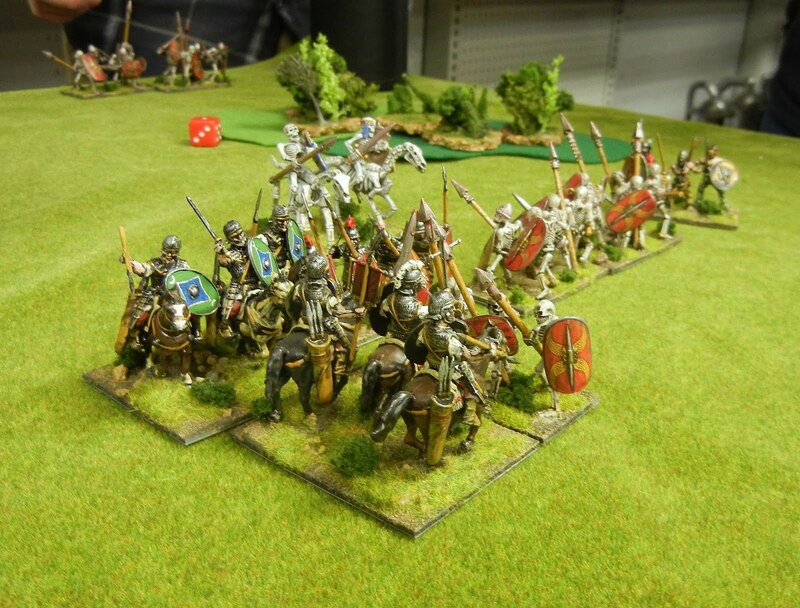 The opening game saw the Normans (right) rush their cavalry forward on each flank. 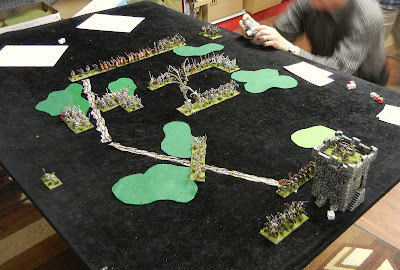 Things then bogged down a bit in the cards but eventually the Normans were able to work their way around the flanks of the Saxons. The Saxons have a huge incentive to stay on the hill. 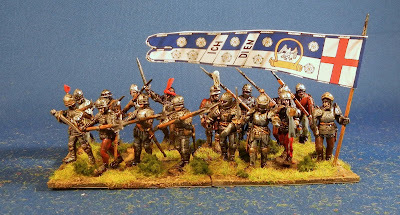 Eventually the Normans picked up the necessary six banners to win while holding the Saxons to two. A tricky game for the Saxons as they must be very patient and also have the right cards at the right time to rush forward for a win. The second game was very different, with the Normans rushing forward on their right flank and a huge amount of horse dying trying to push the Saxons off the hill hex pictured below. 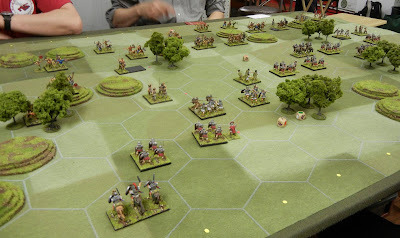 The Saxons were again patient but, between the mauling of the Norman cavalry and a quick rush off the hill into melee at the end, managed to eek out a 6-5 victory. I'm not sure the command mechanic worked quite perfectly. 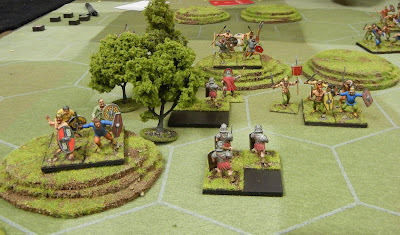 And the scenario didn't give the Saxons a lot of options. Perhaps something more flexible next time, like Stamford Bridge? 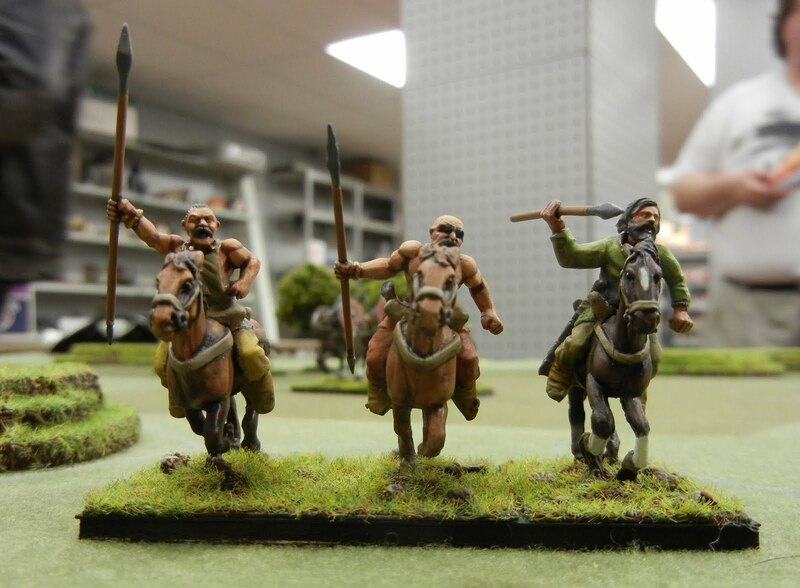 Figures are 28mm plastics: Conquest Games horse and Wargames Factory foot. Dave hosted Chen, Barry and Carl (CARL!) in a reprise of Dave's CCN MayDay game. There were two plays of this and, based on the appeals to a higher power, Barry did not have much luck. I left before the final game was finished, but it was down to a single unit to win it for either side. Up next: I have some HYW that are almost done (just need another hour of painting before basing them) and some 15mm Philistines that are glued to paint sticks and I will primer them tonight. 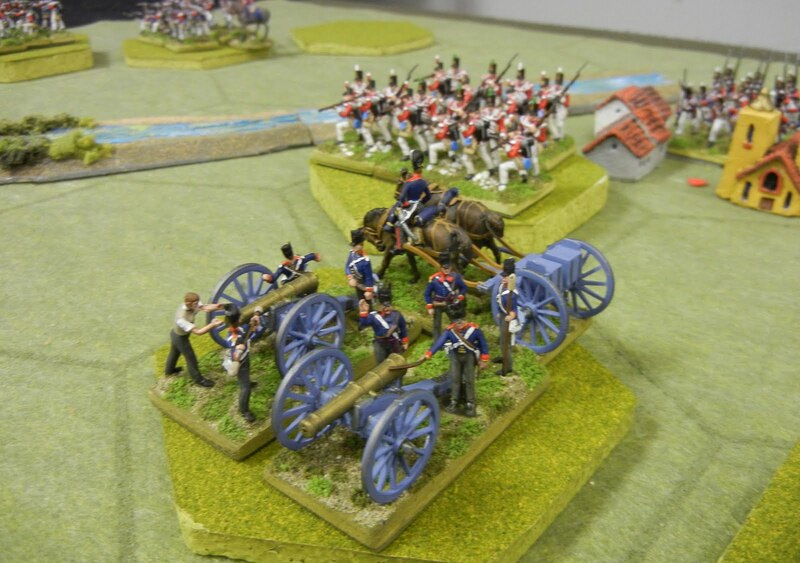 Then some 28mm Norman foot and then another 15mm DBA army. At our club's annual convention, we hold an auction to help defray rent. This year folks were quite generous with their bids and I only won two lots. The first was the boardgame Britannia. 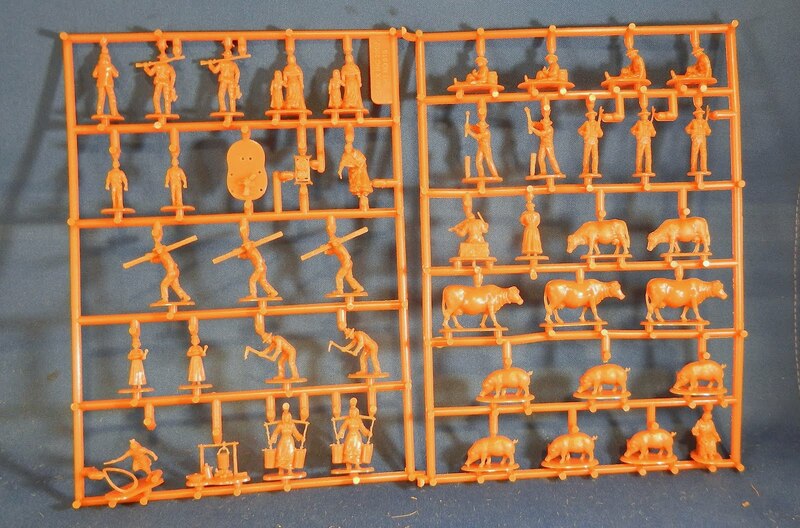 The second was a mixed lot of 1/72 AWI figures, some fences and a huge 28mm hut (cast in a lovely chocolate brown resin). I had 15 minutes last night before Mantracker started so I sat down to knock it off as a dark ages camp. I painted this literally as fast as I could and then gave it a wash this morning. I have to say, I'm pretty happy with the outcome. 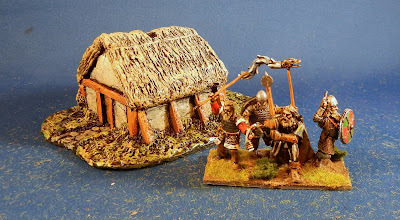 It looks like something you might find in a Saxon or Viking camp and it fills a need I have for both armies. 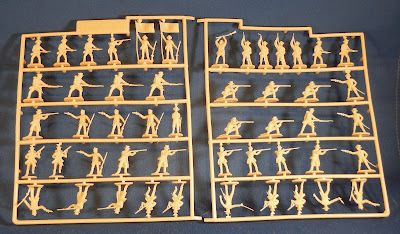 Up next: If I can get myself out of the garden, I will complete the HYW English army--it is about half painted and I plan to put in an hour this afternoon. 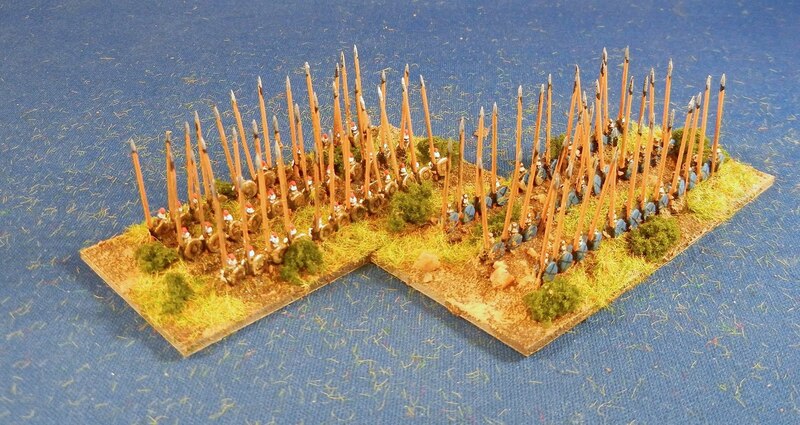 Then a couple of 15mm DBA armies came in as a commission so I'll turn my attention to them. Then maybe some more Star Wars? 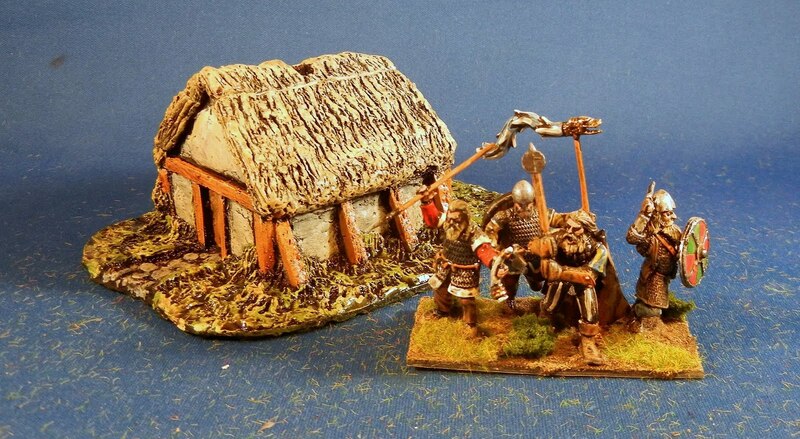 Or some 28mm Normans? There is also club this Tuesday. 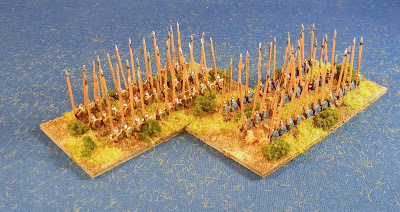 Starting back in 2009, I began the process of rebasing all of my 6mm troops from 40x20mm bases to 80x40mm bases. I finished most of this last year but there was a lingering box of Greek pikes. I finally sucked it up and did them. These are Baccus with nipped off straight pins for pikes. I did 20-odd bases of these the other night, one set with the gold shields and one set with the blue. That is 700 and some figures all told. If things work out, these fellows will be on their way to a new home, freeing up a huge amount of shelf space for new projects. Up next: Assuming I can get away from gardening and cycling, I'm looking to finish a 28mm HYW army. I'm not sure what comes after that. I have some more 1/72 from the auction this weekend that could be used to supplement my War of 1812 and AWI troops. 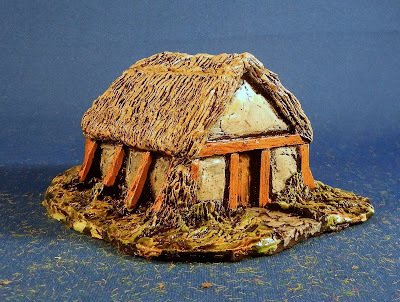 There is also a house that would make a nice camp for my dark age armies. Or maybe some superhero repaints? I also just got a box of stuff for a 15mm commission that I should open up tonight and see what is what. With our annual convention nothing but a distant memory of games and acetone leaking down from the nail salon only to be overpowered by BO within an hour, I thought I'd post the rest of my pictures. I did not get snaps of each game and some did not turn out due to the low light. First up we have Chris (instructed by Robert) cutting out terrain for Justin's game of Command Decision. Nothing like the last minute! And here it is on the table. 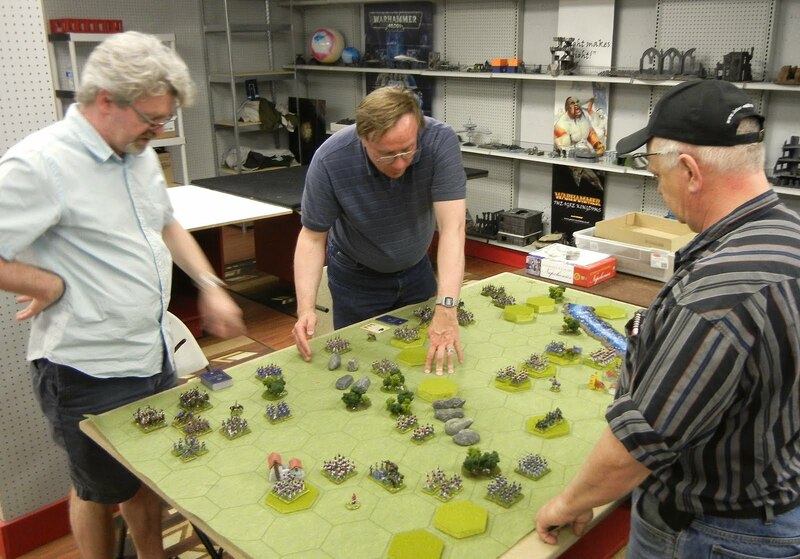 How many wargaming projects come to fruition so quickly? Here the vultures circle the auction, looking for a deal. 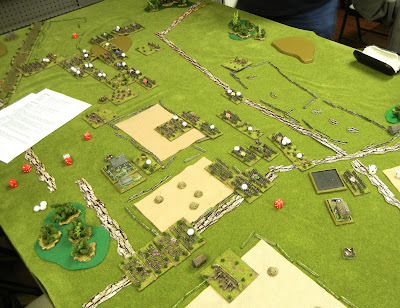 This is an overview of Dave's game of CCN. This was Kevin's CCA game. Oh, things do not look good for Crassus! That poor fellow just can not get a break! 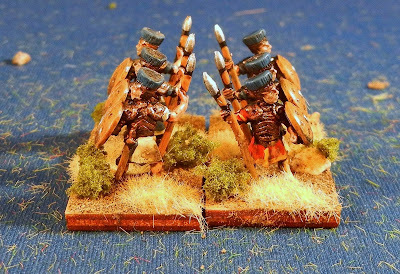 Up next: Some rebased 6mm pike and then some 28mm HYW. The first game I ran at MayDay was a redux of Teuteburg Forest, with the (now undead) forces of Varus seeking to regain their honour after being struck from the rolls by Augustus by bagging a Roman patrol as it was returning to its outpost on the Rhine. 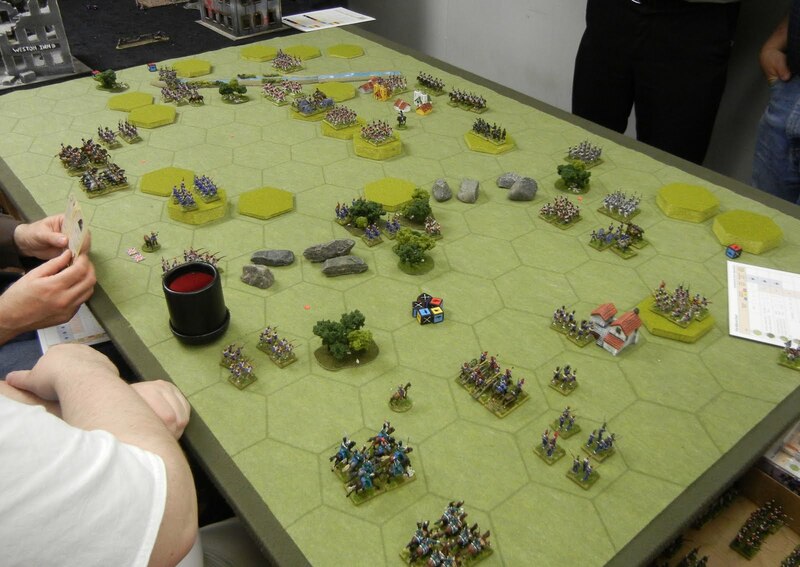 I used HoTT for the rules and 28mm plastics (GW and Wargames Factory) and there were five players--three Varian commands rolling 1d4 for pips and two Romans commands rolling 1d6. After three (or four?) playtests, I'm a bit chagrined we still didn't all of the kinks out. Game 1 went reasonably well. 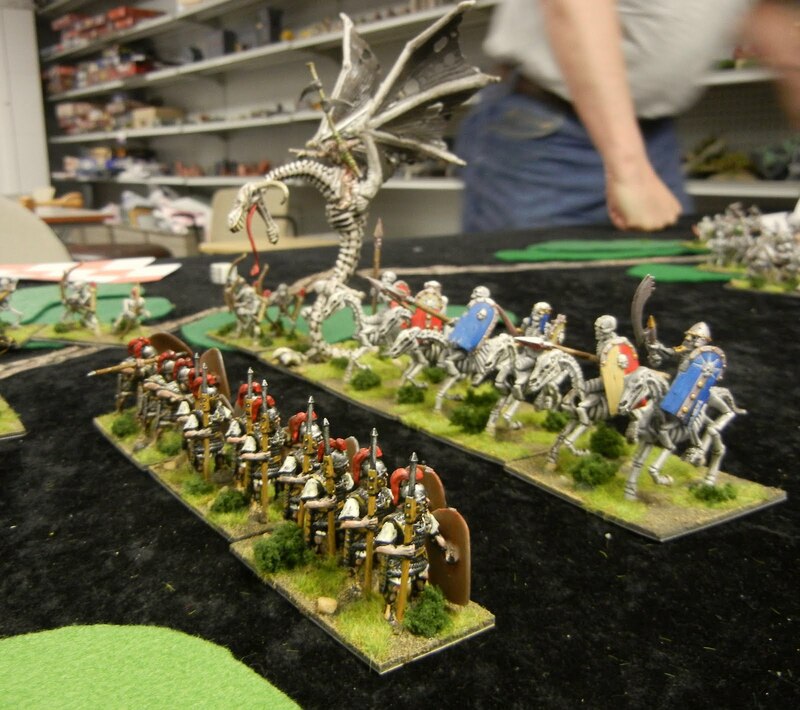 With the small garrison of the outpost, Dave managed to break two of the skeletons commands with cagey play and some good combat dice. 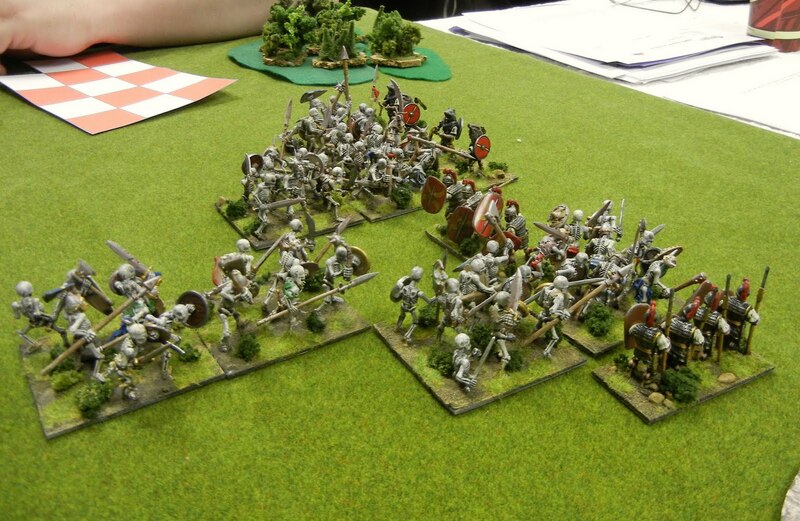 Terry, on the other hand had a helluva time with the skeletal warband in the woods (below). We called it when it was obvious that the Romans would be able to gang up on the skeletons and win. 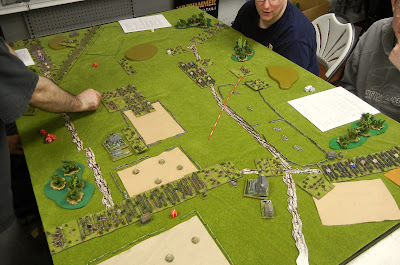 Game two went... errr... less well as the players mostly switched sides and put what they learned to use. 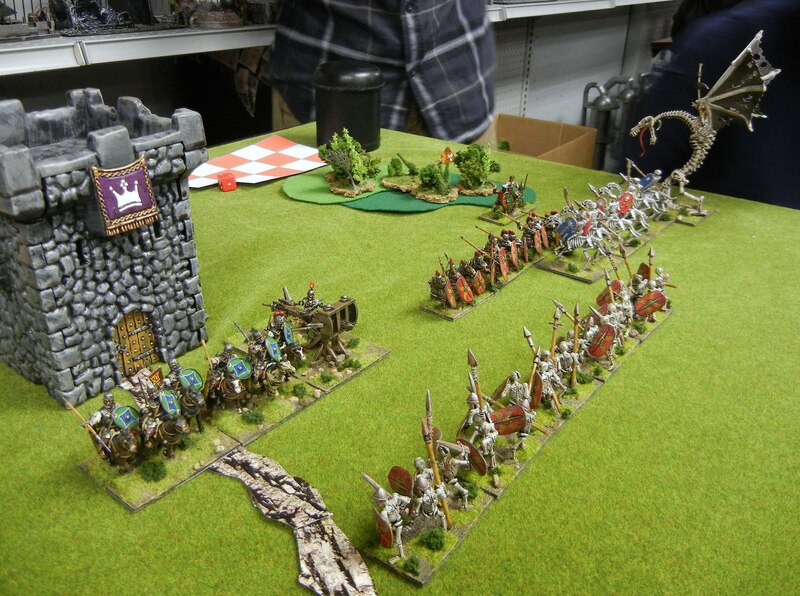 The skeletons first obliterated the garrison and then sacked the outpost. 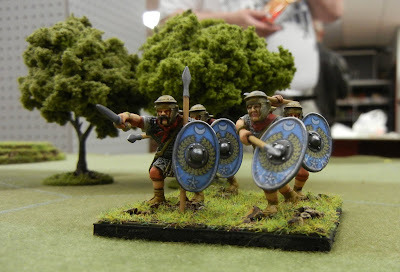 And they were also doing quite a number of the Roman patrol. Overall, nasty, brutish and short--not exactly a fun game for the Romans. Not sure how to fix that--perhaps reducing the Varian set-up options, making the Varians set up first or maybe increasing the number of Romans. And the powerful smell of nail polish remove from the salon upstairs making its way into the ventilation did not help matters. Up next: A general MayDay wrap-up then some HYW English. But now off to the garden to plant! Today was the club's annual MayDay convention. One of the games I ran was a big battle DBA game. I took the scenario from Mr. Farrow's blog. I used the Humberside extension to the DBA rules with limited recoils, mobile generals and a breakpoint roll. Above you can see things are calm, with one of the three commands for each side on the board. Below you can see things are heating up as Marco and Stephane bring on the Brits (foreground) against Mark's and Dennis' American troops. The battle opened on the British right with two columns slamming into one another and then battling to a stall. The British right command lost its general and then hit its break point and I feared the game was over before it started. But then the British became vengeful, which kept them in the game despite having a pip penalty. Marco played this very well, helped by some pretty good combat rolls. 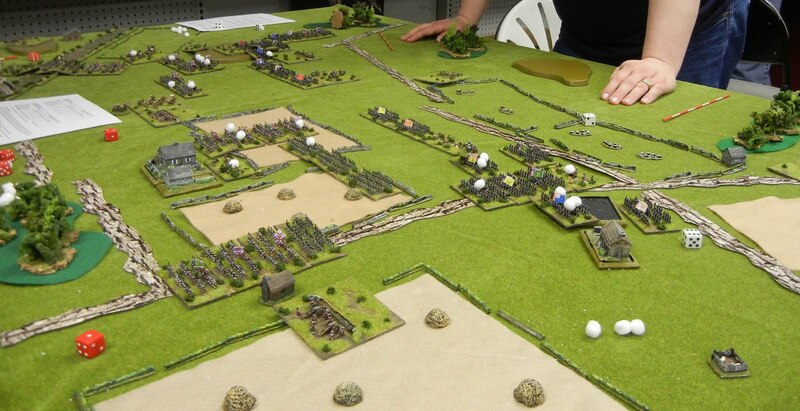 Below, you can see in the distance the British left is slowly developing while the centres remains far apart and trade ineffective cannon fire. 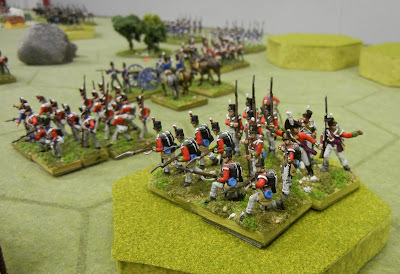 Below you can see the Americans massing for a push on the British right while on the British left a nasty fight over a knoll has developed. The middle remains quiet but an interesting seam has opened in the American centre. As the game concluded its third hour, we were forced to call it. On the British left, things are very much up in the aim with the Americans past their break point and still struggling to fully deploy. In the centre, the British were about to heave the American left back and lever open a door. 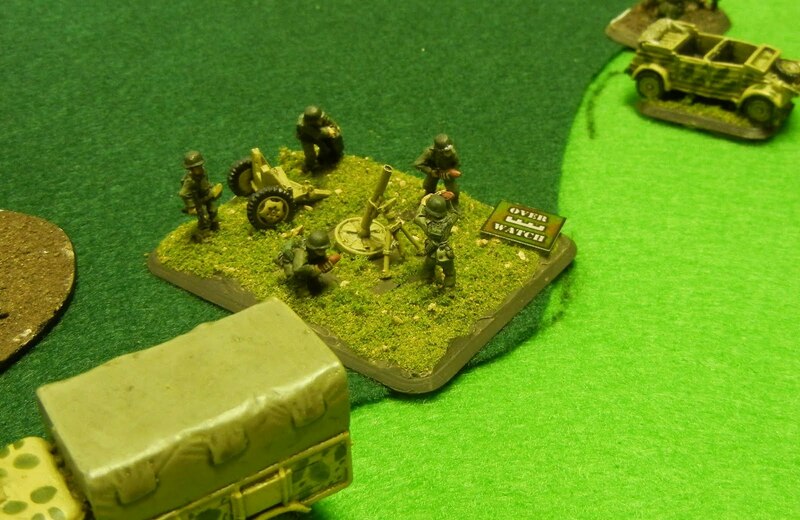 But on the British right, further casualties saw the wing start to collapse. If the game has gone on we would have seen a revolving door effect in the foreground with a clockwise spin. 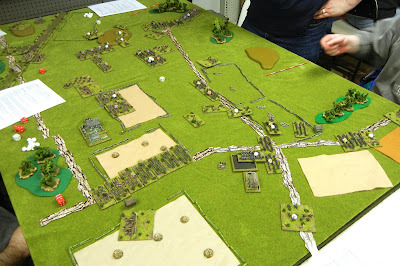 At the end of the game, the Americans had taken one more base of casualties but had bagged a British general so I called it a draw. Another hour would have seen an interesting end game develop. Not bad for a games snagged from a website, boxed up the night before and thrown down! Up next: A report on a HoTT game and then a general MayDay report. 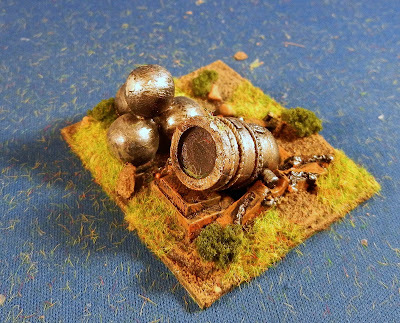 By then I may have some 28mm HYW English done. We had seven guys out last night with two games running. It appeared to be fantasy night at the club as Dave brought his Elves and Kevin brought his lizards and they double teamed Scott's demons in The Battle of PottyMouth Pass. Chen, Jonathan, Terry and I gave my revised MayDay game another try and this time it worked (stripping out all of the cool ideas and just running a straight fight...). You can see that events are transpiring in a very dark forest somewhere on the Rhine, with the far Romans caught away from their camp by a group of undead warriors. Terry had good luck tangling with the Romans on the left flank but things did not go so well on the right. 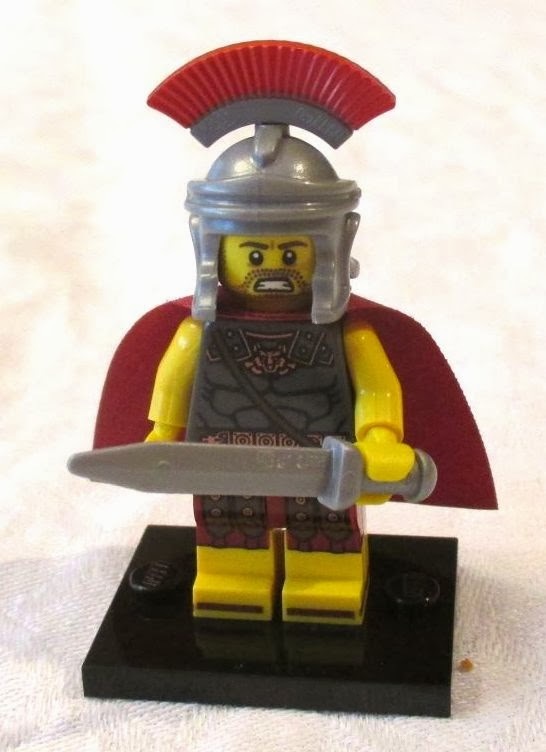 He likely could have used a few more of the troops I took to contain the helmeted goons in their fortress. Luckily, the dice were hot for the undead at the fortress and I managed to break the Roman command there. 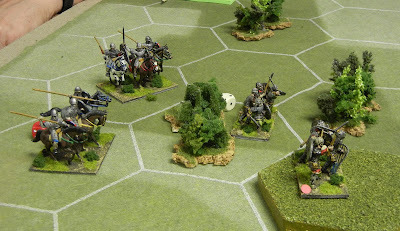 This freed up some guys to help shore up Terry's flank although a lucky knight attack on the Roman stronghold actually bagged the game. It was bloody close at the end. 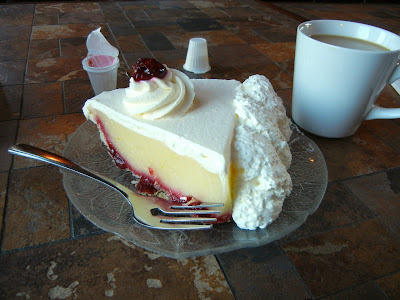 Then we went for pie. Up next: Well, MayDay is Saturday.I have one game ready to go (except I need to nail down the scenery). And I have another game to prep from scratch (ack!). And I have some HYW English on the painting table. The treasury is running a bit low so everyone bring your wallets to the auction so we can keep dues low. There look to be some really good items up for bids.